Father Brown returns to solve more mysteries in the sleepy Cotswold village of Kembleford in this charming series based on the short stories by G K Chesterton. Each episode sees the inimitable priest investigate a crime in his own particular way, aided by no-nonsense parish secretary Mrs McCarthy and rebellious socialite Bunty. This series sees Father Brown investigate a suspicious death at a care home, and a local bowls match quickly rolls out of control when it becomes a murder scene. There¡¯s also a fatal school fete and a soviet spy to contend with, and old foe Katherine Corven looks for revenge on Father Brown when she is suddenly released from prison. SDH. It¡¯s December and Father Brown, Mrs McCarthy and Bunty are visited by an old friend as they make mince pies and decorate the presbytery. Sid, has returned for Christmas, bearing gifts from Lady Felicia. Meanwhile as locals walk through the woods, a dog uncovers a partially skeletonised hand in the cold ground. The body is identified as Scarlett Dreyfuss, a woman reported missing after the dress rehearsal of Red Riding Hood in 1946, throwing open a seven year old case. But that doesn¡¯t stop the Kembleford Amateur Dramatics Society from holding their auditions for this year¡¯s pantomime, Cinderella. Mrs McCarthy is left disappointed when Bunty is given the role of Fairy Godmother over her, while Father Brown and Sid are left with rather undignified parts. When Scarlett¡¯s post mortem is delivered, Inspector Mallory realises that the confession of her supposed killer, gentle giant Benny, is a pack of lies. 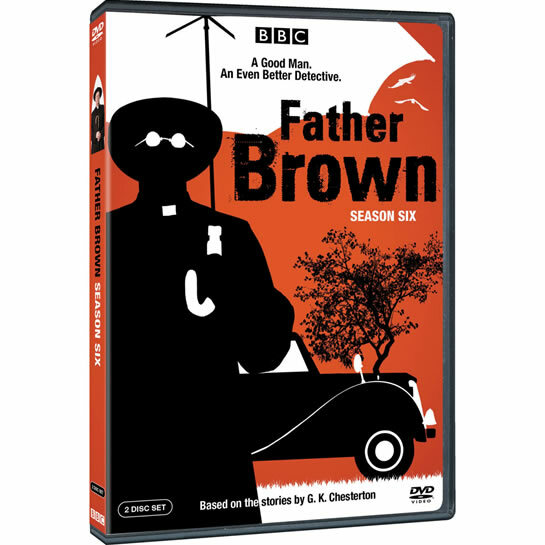 A terrible miscarriage of justice has taken place – can Father Brown overturn it in time for Christmas? Julia Webb boasts about her award winning hanging baskets to Mrs McCarthy as Ben Webb shows the station inspector, Deepak around the train station. Pandora, the new cleaner at St Mary¡¯s, gets off the train and immediately frustrates Mrs McCarthy. Deepak leaves a poster for Ben and as Julia pins it on the noticeboard, Ben collapses from a heart attack, reading: ¡®Notice of Closure¡¯. During a village hall meeting, Buddy Arnold tells the crowd that he¡¯ll be running a replacement bus service when the train station closes but Julia can¡¯t contain her anger and throws water in his face. Holding a fete at the station in an attempt to save it, Julia orders Ben off to the washroom to smarten his appearance, but when he returns he is in a much worse state; stuffed inside a trunk with his head dripping with blood.